I came up with a slightly different way of making brownies. I was so pleased with them, I named them after me (is that wrong?). The texture is soft and fudgee rather than chewy. 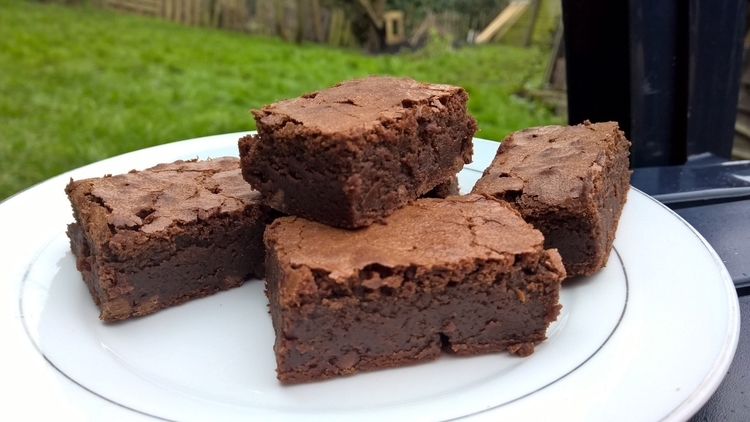 I do generally prefer a chewy brownie, but sometimes it’s good to try something different right? As these are softer I think they would work really well as a dessert with ice cream or cream – no struggling to get through them with a spoon! I’ve both made it myself and bought the ready-made kind, and I can confirm they are the same. 2. 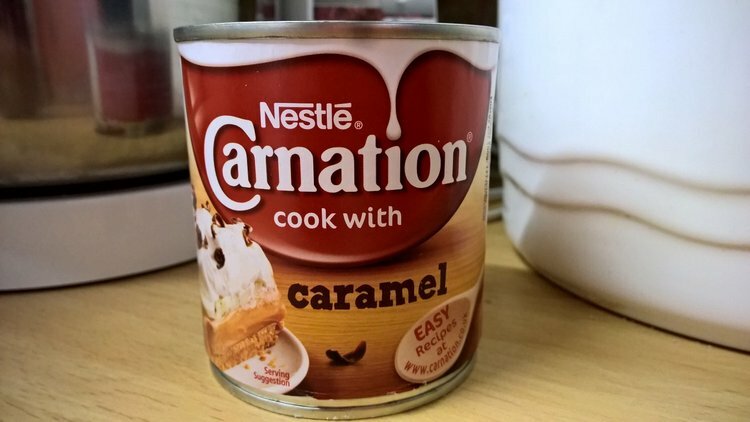 Place 250g of the caramel with the butter and the dark chocolate into a heatproof bowl and set it over a pan of simmering water to melt. Using a balloon whisk, stir it regularly until it’s all melted and smooth, then pour it into another large bowl and leave to cool for about 10 minutes. 3. Mix in the sugar, and then the eggs one at a time, and then the flour and cocoa. 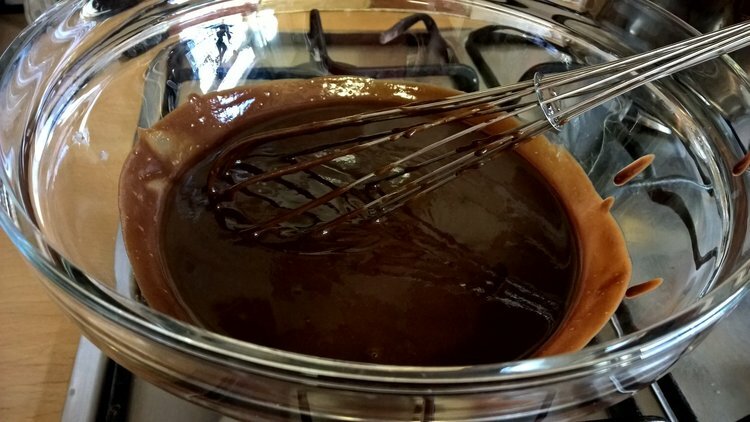 As the mixture is very liquid, I find it easiest to continue using the balloon whisk to mix everything, but don’t over whisk it, you really just want it to be combined, not beaten. Stir in the chocolate chips. 4. Pour it into a baking tin lined with non-stick baking paper (enough up the sides so that you can lift the brownie out later). 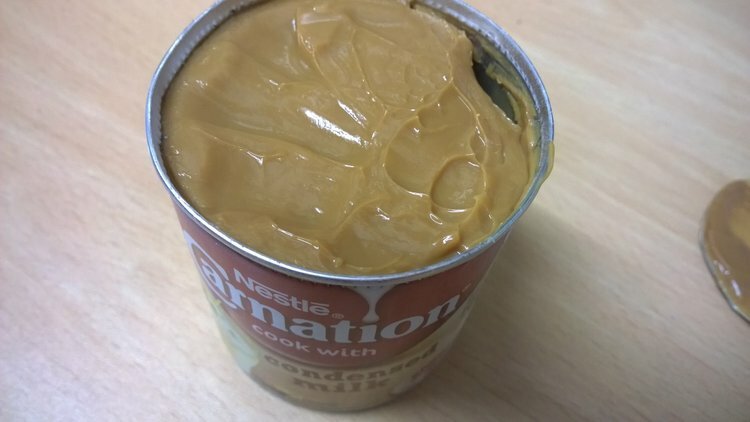 My tin was 25cm x 17cm. 5. Place into a preheated oven 180C/350F for 30-35 minutes. To test if it is done, insert a toothpick, it should come with a couple of crumbs on it, not completely clean. 6. Leave it to cool for 10 minutes in the tin then lift it out onto a cooling rack. Leave to cool completely before cutting into squares. Mmmm, me too! I’m not particularly a chocolate cake fan, but brownies yes, and hot fudge brownie sundae, YES! Maybe some crushed salted peanuts on there too. Definitely not wrong to name them after you! It sounds like something you’d buy from a store. Are these chewy it more cake like? They look delicious!! They’re not really cake like or chewy, they’re dense and fudgy. I was thinking for valentines of making a batch in a larger tin so that they are thinner, then using a small heart shaped cutter to cut them out, and then maybe some buttercream and sprinkles on top. I think they would cut well. Thanks for stopping by, I shall stop by your place in a bit! Well yes indeed! I did several cans in one large pot because it seemed far too extravagant to have a pot simmering for 3 hours for just one can! But actually there’s no reason to not buy the ready done cans, it’s not like the home simmered version is healthier or anything! 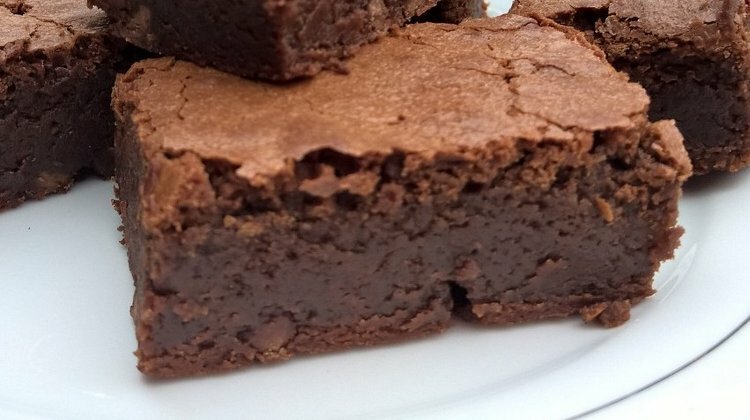 This one definitely beats the Oh So Simple Brownies. I made the Oh So ones a few times and got variable results, sometimes good and other times to cakey, but these ones I’ve made three times now and all have come out great, so it’s this one all the way now! (if you’ can’t already tell I’m catching up on some posts.. LOL ) OH MY GOSH this looks beyond amazing. I say you name anything you want after yourself if they’re as good as they look! Also, I think everything should be made of actual butter, bleck to that margerine stuff! Me too on the butter! It’s so much nicer isn’t it!